Your hosts at Pacific Harbour Motor Inn are Graham and Karen Brown, who are on site to make your stay as comfortable and enjoyable as possible. We welcome all business travellers and those enjoying a holiday in Gisborne. Pacific Harbour Motor Inn has a style of its own, with clean lines, colours and angles in keeping with its stunning maritime location. 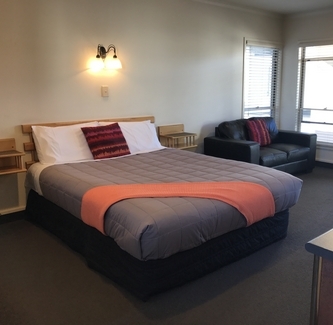 Although we are only a few minutes walk from the main business, shopping and dining areas of town, we enjoy a quiet and peaceful location overlooking the palm-tree lined bank of the Turanganui River and the inner harbour marina. 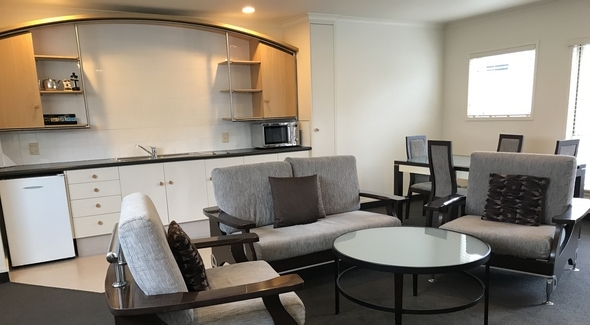 The wide range of units available at Pacific Harbour Motor Inn offers quests the options of studios, spacious suites and family units and smaller compact units for those just wanting to put their head down in our superb location. The kitchen units include cooking appliances (microwave and electric fry pan). The bathrooms have fittings including wet-area showers. Some of the larger units have shower over baths. Continental breakfasts are delivered to units to order. Off-road parking free of charge. Stay for a minimum of two nights and receive complimentary continental breakfasts. Or. Stay for a minimum of three nights and receive a 10% discount on advertised nightly rates. Applies to Friday, Saturday, Sunday and Monday nights from 1 June to 31 August 2018 only, subject to availability and does not apply to Public Holiday Weekends. Contact us directly on 06 8678847 or info@pacific-harbour.co.nz and mention our website special deal. The kitchen units include cooking appliances (microwave and electric fry pan). The bathrooms have fittings including wet area showers. Some of the larger units have shower over baths. Continental breakfasts delivered to units to order. Off road parking free of charge.